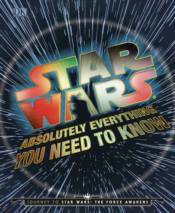 The updated edition of this bestseller with fascinating facts and fun trivia from everyone's favorite galaxy far, far away! Star Wars: Absolutely Everything You Need to Know is now updated and expanded with brand new weird and wonderful Star Wars trivia, strange-but-true facts and fascinating 'Did you know?' Q&As. Find out who cleans the floors of the Death Star and what takes 1,000 years to digest its victims! From movie-making trivia to quirky data you never knew, this book will excite new and old fans alike of the latest Star Wars movies, Star Wars Rebels, and Star Wars: The Clone Wars.